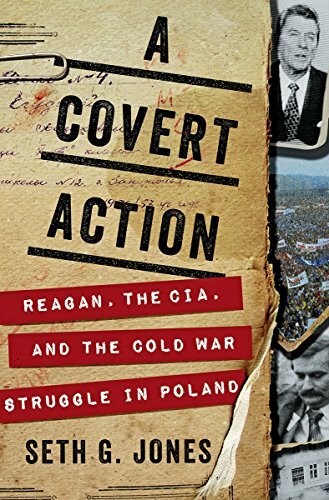 Jones, the Harold Brown Chair at the Center for Strategic and International Studies, focuses on a CIA covert program formally approved by President Reagan on November 4, 1982, codenamed “QRHELPFUL,” that sought to sustain the Polish union Solidarity during the imposition of martial law by Polish leader Wojciech Jaruzelski. Jones notes that QRHELPFUL was one element—perhaps the most important element—of Reagan’s grand strategy to end the Cold War peacefully. It was a grand strategy that sought to exploit the vulnerabilities of Soviet rule in Eastern Europe and ultimately in Russia itself. Reagan hinted at the grand strategy in public speeches wherein he characterized communism as a sad, bizarre chapter in human history that was coming to an end. Reagan publicly predicted that the West would not contain communism, it would transcend it. Reagan also approved several important National Security Decision Directives, authored by the late Harvard historian Richard Pipes (who served on Reagan’s National Security Council staff), that authorized policies designed to undermine Soviet control of Eastern Europe. Jones describes the rise of the Solidarity labor union in Poland under the inspiring leadership of Lech Walesa, a worker in the Lenin Shipyard in Gdansk. Solidarity was more than an independent labor union; it was the beginning of an organized political opposition movement that had widespread support throughout Poland and within the Catholic Church. Solidarity’s rise coincided with the historic election of Pope John Paul II, a native son of Poland who showed the world that 35 years of communist rule could not suppress the spirit of the Polish people and their longing for freedom. The Polish government, at the urging of Soviet leaders, cracked down on Solidarity and political opponents by imposing martial law in December 1981. Polish security forces raided Solidarity offices, set up roadblocks, seized media offices, and arrested and imprisoned more than six thousand Solidarity activists, including Walesa. QRHELPFUL was not the brainchild of any one person within the Reagan administration, but instead resulted from ideas put forth by Richard Pipes at NSC, Robert Gates at CIA, National Security Advisers Richard Allen and William Clark, Defense Secretary Caspar Weinberger, CIA Director William Casey, and a “working group” of lower level officials. Jones praises the unheralded work of CIA assets who implemented the covert program, including businessmen in several European countries. These assets developed methods to funnel money and goods to Poland to keep Solidarity alive and to aid its subversive efforts within Poland. Robert Gates described these efforts as “underground political warfare” of the type recommended in the early years of the Cold War by James Burnham in his brilliant trilogy, The Struggle for the World (1947), The Coming Defeat of Communism (1949), and Containment or Liberation? (1951). CIA money was used to publish underground leaflets, posters, journals, and newspapers, and to purchase typewriters, paper, and copiers for Solidarity. QRHELPFUL created a clandestine network of European businessmen, physicians, intellectuals, smugglers, political operatives, and even clergymen to help sustain the political opposition in Poland. Jones describes the European “ratlines” or routes “used to covertly smuggle material, people, and money from one location to another.” The ratlines originated from such cities as Rome, Paris, Brussels, Hamburg, and Stockholm. Reagan kept up the pressure on continued Soviet rule in Eastern Europe, famously urging Gorbachev in June 1987 to tear down the Berlin Wall. That same month, John Paul II traveled again to Poland where he “openly embraced Solidarity and its [political] goals.” This, Jones writes, was a direct challenge to the communist regime. The end game came after Reagan left office. His successor, George H.W. Bush skillfully played the strong hand that Reagan left him and presided over the collapse of the Soviet empire in Eastern Europe. Solidarity and its leaders gained power in Poland through democratic elections. The other satellite countries in Eastern Europe broke free of Soviet rule. Ronald Reagan, with the help of the Pope, Lech Walesa, and other courageous Poles, and many unheralded CIA assets, had reversed the stain of Yalta.